Wild Tundra. 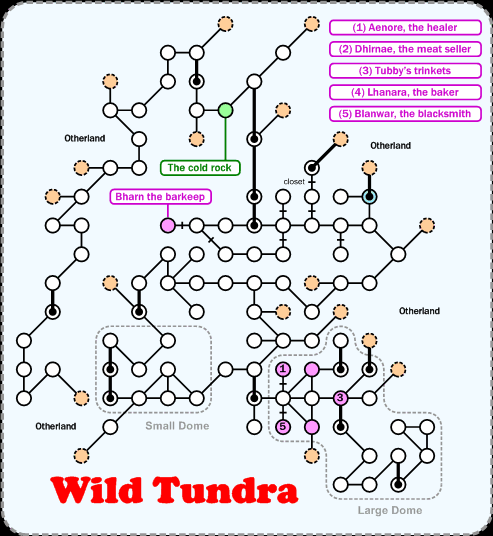 Most of the exits into Otherland lead into the Tundra Fields maze. The only mob of note is Brunhilde. Walk ( 6s, ne, 2s, se, 2e, s, 2sw, s, 2e, u, 3e, 3s, se, 3e, s, 2se, 3s, sw, w, sw, d, nw, s, 2e, 2se, w, nw, sw, 2w, s, d ) to get from DH to the room marked in blue.